Shell Lubricants is known for its technologically advanced formulations and noticeable benefits through its Rotella, Spirax, Pennzoil and Quaker State brands. Each brand offers a complete line of high quality products for an assortment of applications and conditions. Rotella T is the most preferred brand of heavy duty diesel engine oil among owner operators and diesel pick-up owners in America. * For additional products or technical information not listed below, contact Overlake Oil directly at 800.722.7743. Shell Rotella T Triple Protection provides triple action to help control wear, deposits and emissions to continuously adapt to the needs of your engine for protection in on and off highway applications. It is designed to provide extra performance. 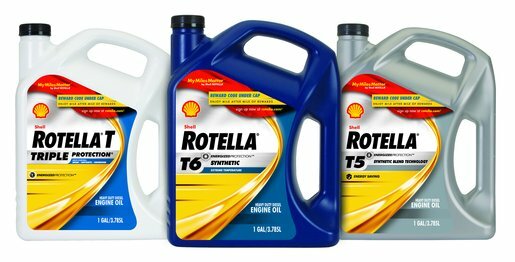 Shell Rotella T6 is a full-synthetic heavy duty engine oil that combines the proven technology of Rotella T Triple Protection with the benefits of synthetic motor oils. Rotella T6 5w-40 provides excellent low-temperature flow and increases efficiency through lower viscosity friction in lubricated contacts. By reducing the energy used to pump oil through the engine, it has potential fuel consumption savings of up to 1.5%. Rotella T6 also has unsurpassed protection against sheer stability degradation compared to the completive products. Rotella ELC fully formulated coolants deliver protection against overheating, corrosion protection and maintenance savings through prolonging the life of seals, hoses and other cooling components. Rotella ELC utilizes organic additive technology corrosion inhibitors with nitrite and molybdate that prevent pitting corrosion damage on cylinder liners and are designed to go 600,000+ on-highway miles. Spirax offers a full range of superior performance axle, gear and automatic transmission fluids are proven in an array of applications and conditions. Spirax S6 AXME is a unique, fuel-efficient, long-life axle oil designed to provide the ultimate protection for heavy-duty axles and manual transmissions where axle oil is specified. Pennzoil offers a full line of motor oils that turn every engine into a self-cleaning engine. From Pennzoil Conventional to Pennzoil Ultra full synthetic there’s a Pennzoil for every driver. Pennzoil recently released Pennzoil Ultra Platinum™ Full Synthetic with PurePlus™ Technology the first motor oil on the market formulated from natural gas. This revolutionary patented process converts pure natural gas into a high quality full synthetic base oil. Quaker State offers a full range of economical motor oils with enhanced durability for people that care about what goes in their vehicles.